This morning, we have another awesome project to add to our list of amazing bottle architecture - this cleverly constructed schoolhouse in San Pablo, Philippines, which happens to be the first of its kind in Asia. 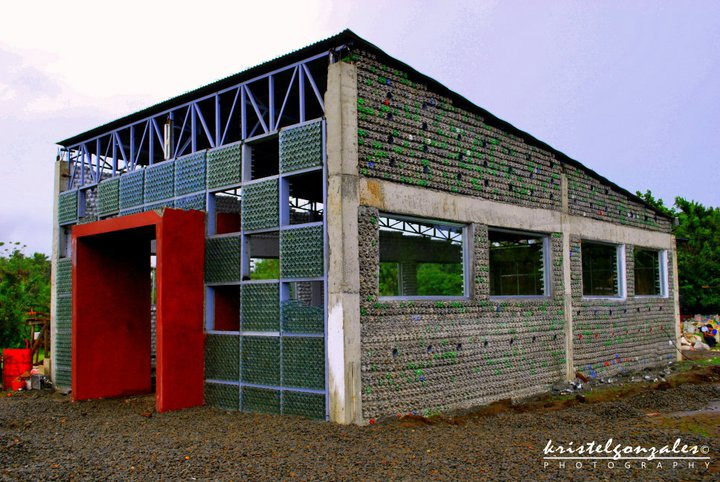 The innovative building was conceived and constructed by Illac Diaz and MyShelter Foundation as a way of turning a negative - an abundance of discarded plastic bottles - into a positive - a brand new place for children to get their learn on. The school is made from 1.5 and two-liter soda and water bottles filled with adobe, a combo that is relatively cheaper than concrete and - get this - is also about three times stronger! From family homes to entire temples, we’ve seen a lot of bottle architecture here at Inhabitat, but this is the first bottle school we’ve come across, and we think it makes so much sense. Plastic bottles are every where, and until we can finally do away with them completely, why not turn them into livable, usable structures? In order to raise awareness for the school, MyShelter Foundation organized a run in June. They also collected bottles – which most people were more than happy to get rid of – at the event. The Bottle School was constructed with the help of dozens of volunteers who secured the bottles with liquified adobe and steel bars. The site was donated by the local government of San Pablo. “It’s very empowering because what used to be a problem is now a solution,” said Mr. Diaz about the inspiring project. Congratz to MyShelter Foundation for completing their very first Bottle School and stay tuned because word on the street is that there are many more schools like this one in the works. Hi, I would like to ask ,Is this method could also be applicable in multi storey school building? hi im a student from csb and im a part of an organization named JMA junior marketing organization. i am just wondering if it is possible for us to tie up with u and make a bottle school also? if ever what are the requirements? thanks hope for your response. What a beautiful bottle school! Another organization, based in the USA, is also building bottle schools - in Guatemala. Hug It Forward has completed 7 bottle schools since October 2009, and has 3 more projects under way. 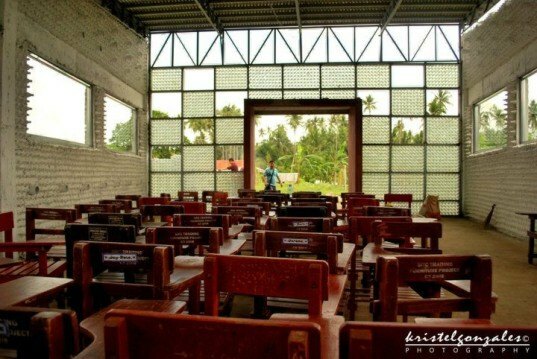 By building with "waste" materials, leveraging the volunteer labor of the community, and by ensuring that 100% of donations are spent on projects (no money is taken for overhead or salaries), they can build a two-classroom school for under $10,000. Brilliant. Simple, sustainable and effective. Let there be many more, not only in the Philippines but around the world. Congratulations to the design and construction teams. In putting things together, so many homeless in America picking up bottles each day for surviving and to never live in one house built by these bottles is an expected frown from God, I wish I could make the homeless a home with this, seems God already placed the idea on someone! When my parents did not want to pay rent anymore, they went to the mountains and cut the trunk of a lot of cactus, took that to a land and mixed adobe mix and wire (clay, water and hey)to kind of glue them together, that was our very first own home, I will never forget that, then my mother built a house for the hens out of bamboo sticks knit with wire, it no longer exist, so I wonder how long would this bottle structure will last? Remarkable innovation on the bottles!!! What is this adobe ? what is it made of ? (and how ?) Why is it stronger then concrete ??? Thank you so much for showing the world this grand project thru my photos! It's my honor to be part of this magnificent innovation. I, together with Mr.Diaz, plan to take more shots of the fully-finished buildings by first quarter of this year. Please keep me and Myshelterfoundation posted if these photos are to be used for other purposes. Thank you. I have seen a few creative designs using plastic bottles this is without a doubt the best! I will check out the other buildings that made from plastic bottles. sustainable architects are wonderful sustainability and beauty. That translucent front wall is beautiful. This is a great project that addresses both environmental and social sustainability. Really fantastic and a perfect submission to the Holcim Awards for Sustainable Construction: http://on.fb.me/holcim-awards This is exactly the type of project that wins some of the $2 million USD in prize money worldwide. From family homes to entire temples, we've seen a lot of bottle architecture here at Inhabitat, but this is the first bottle school we've come across, and we think it makes so much sense. Plastic bottles are every where, and until we can finally do away with them completely, why not turn them into livable, usable structures? Inside, the school is airy and bright. We thought that the way the architects alternated bottle "tiles" and open air in a checkerboard pattern was pretty unique. It isn't easy to make a bottle building look modern and we actually think this school achieved that through clever design. In order to raise awareness for the school, MyShelter Foundation organized a run in June. They also collected bottles - which most people were more than happy to get rid of - at the event. The Bottle School was constructed with the help of dozens of volunteers who secured the bottles with liquified adobe and steel bars. The site was donated by the local government of San Pablo. A closer look at the adobe-filled bottles that make up the building. “It’s very empowering because what used to be a problem is now a solution,” said Mr. Diaz about the inspiring project. Diaz takes in his organization's achievement. Congratz to MyShelter Foundation for completing their very first Bottle School and stay tuned because word on the street is that there are many more schools like this one in the works.